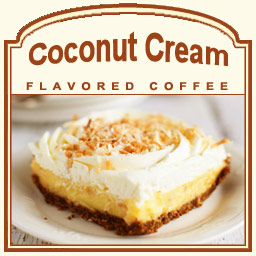 Coconut Cream is the perfect flavored coffee for those that love coconut. Made with freshly roasted Arabica beans, this delicious flavored coffee will feature a rich cream that fuses brilliantly with the fruity, subtle tang of coconut juice. Let this flavored coffee sweep you off your feet and carry you on an island adventure. With only 2 calories per cup, you can indulge in the tropical coconut flavors whenever you want a little getaway! A heat-sealed valve bag will ensure the freshest coffee, which is why we roast and ship on the same day. Let the smoothness of this Coconut Cream flavored coffee wash over you and your taste buds � it's truly delicious!